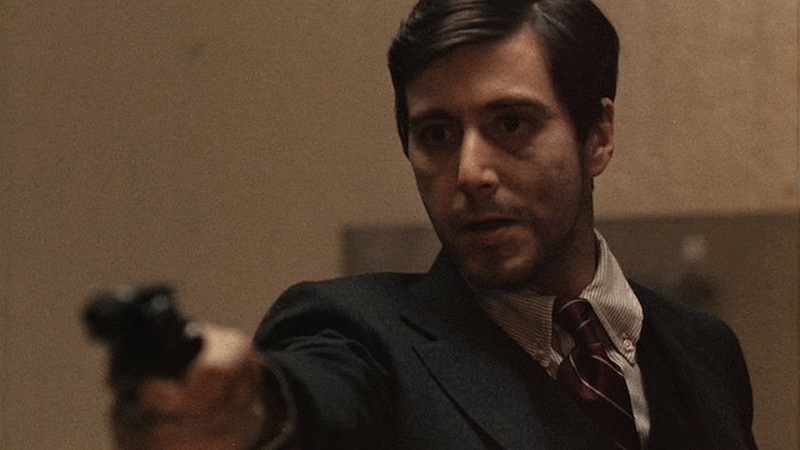 Happy birthday to Al Pacino, born this day in 1940. It was The Godfather that arguably catapulted Pacino into public consciousness as one of the greatest actors of his generation, an impressive feat for an actor with only two preceding film credits. Although Paramount production chief Robert Evans had more box office-oriented names in mind for its central role ranging from Jack Nicholson to Robert Redford, Francis Ford Coppola insisted on Pacino who delivered in spades and received both an Academy Award nomination as well as a massive salary increase (from $35,000 to $600,000) to return as Michael Corleone in The Godfather Part II only two years later. 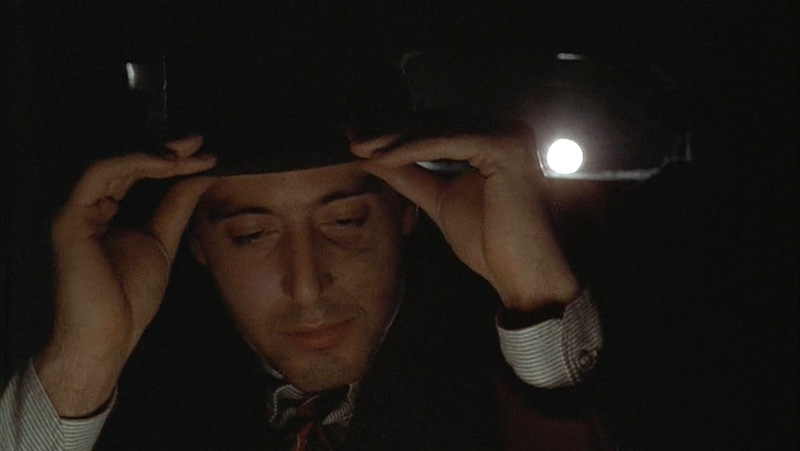 Although all of The Godfather is an acting tour de force for Pacino, there is one monumental scene often cited as the moment that truly established him as one of the most talented stars in the industry. 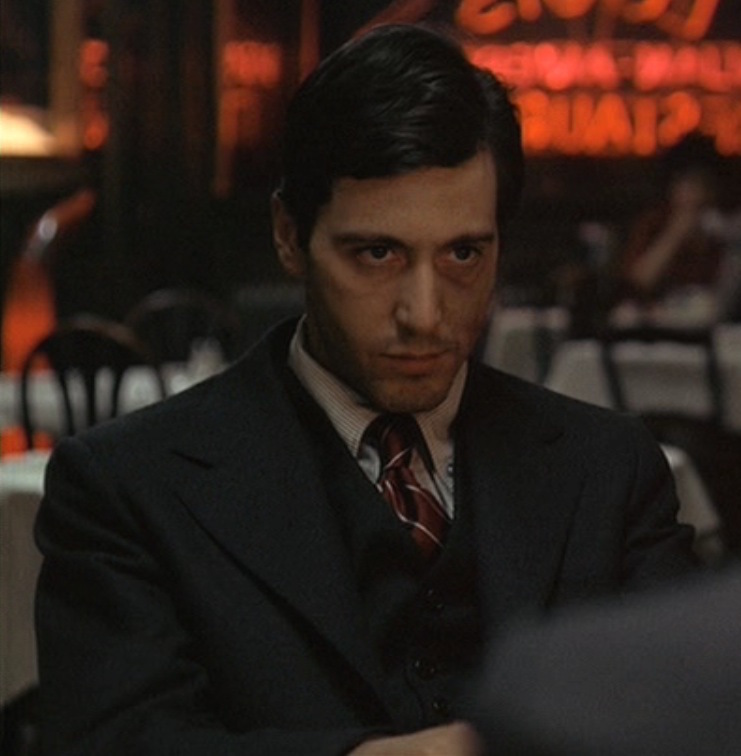 An outsider to his family’s illegitimate business, Michael Corleone surprised everyone by offering to retaliate for the attempt on his father’s life by personally gunning down both the drug-peddling gangster and the corrupt police captain. Armed with the family’s blessing, an escape route, and a .38 taped behind an old toilet, Michael finds himself sitting across from these two criminals for – ostensibly – a peace meeting. Michael, the decorated war hero and dedicated family man, finds himself wrestling with his conscience in the final moments before deciding to take two lives which – though not innocent lives – are still unlawful and immoral to end. The growing sound of an elevated train mimics Michael’s heart as it continues to pound, driving home the effects of what he’s about to do. As the train reaches a stop, so does his turmoil. He rises, gun in hand, and kills the two men. Bada-bing! – you blow their brains all over your nice Ivy League suit. Sonny mocks Michael’s plan for gunning down the parties responsible for the attack on Vito, even citing Michael’s outfit as a factor making him unfit to be a Mafia killer. Granted, Michael is wearing a slightly preppier corduroy jacket when having this conversation but the eventual suit he dons for the occasion – while dark – is still a far cry from the flashy silks and patterns associated with gangsters. Michael’s charcoal gray flannel three-piece suit and striped button-down shirt still reflects the more conservative and understated “Ivy League look” of the era rather than drawing forth any gangland associations. The look more describes the crossroads of rough fabrics and casual clothes – appropriate for both town and country – than any specific tailoring points, although there was undoubtedly a Brooks Brothers influence on what came to be known as the Ivy League look by mid-century. This scene could also play out as a revenge fantasy for anyone who’s ever had to eat with people that chew with their mouths open. The single-breasted jacket has large notch lapels that roll to the top of a two-button front. The shoulders are padded with roped sleeveheads and the back is split with a single rear vent, a conservative concession to the fashionably ventless mid-’40s. There is a welted breast pocket and straight, flapped hip pockets. The suit has a high-fastening vest or waistcoat, a simple single-breasted garment with six buttons up the front; the lowest button is left undone over the notched bottom. Production photo from Michael’s life-altering moment. Little is seen of the matching suit trousers, but they appear to have reverse pleats and plain-hemmed bottoms. Michael also appears to be wearing black leather oxfords and black dress socks, although his feet are never clearly seen on screen. Michael wears the same maroon silk striped tie that he wore for his Christmas shopping expedition and movie outing with Kay, bridging one of the happiest times in his life with one of the most seriously life-changing. The thin white diagonal stripes on the maroon red ground cross down from the right shoulder toward the left hip, originally designed by Brooks Brothers to be a distinctively American differentiation from the British regimental tie. After a monumental internal struggle, Michael follows in his family’s footsteps. The maroon shades of red in the tie stand out from the conservative charcoal suit, evoking the blood spelled that evening as well as the men’s dining options ranging from the burgundy “Italian Table Wine” being served to the red sauce on the “best in the city” veal. Now that he’s officially joining the family business, Michael wears a hat on screen for the first time as a civilian. His dark brown felt fedora has a wide grosgrain ribbed band. According to the very knowledgeable Harris Reiss, who commented on this post, it very closely resembles a classic post-war Stetson with its welt edge, non-pinched crown, and 2.5″ brim. 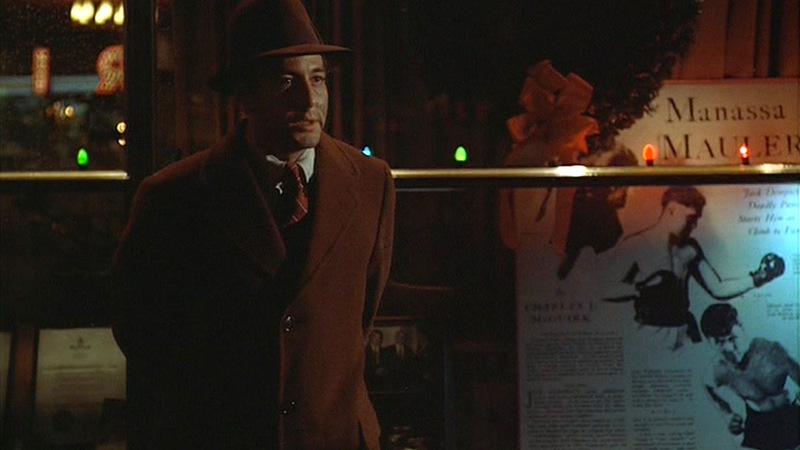 Michael dutifully waits for his ride outside of Jack Dempsey’s place on Broadway. He also wears the same brown wool single-breasted overcoat that he wore when out with Kay. It’s significant that he leaves these brown, earthy reminders of his law-abiding past behind when he is forced to escape his crime. Michael’s sole accessory is his wristwatch, a simple steel watch with a round black dial on a black leather strap. This watch shares more similarities with the military watch that Michael wore with his USMC uniform than with the gold watch sported when he takes over as the family don. Luckily for Michael, Sonny’s prophecy is not fulfilled and Michael’s suit remains relatively devoid of brains. The killing is reminiscent of Joe Masseria’s 1931 demise in a small Italian-American-owned bistro in Coney Island, engineered by “Lucky” Luciano to both end the bloody Castellamarese War and to ensure Luciano’s own quick rise to power. Dutch Schultz and his cronies were gunned down in a Newark chophouse four years later. 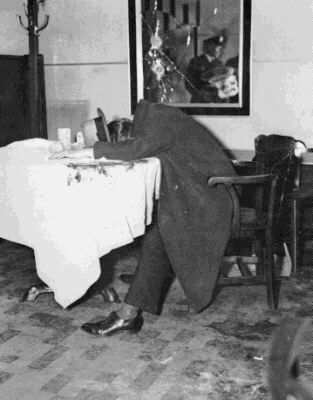 Interestingly, the shot of Sollozzo and McCluskey dead at the table brings to mind both the now-famous image of Schultz collapsed on his table, mortally wounded, as well as almost eerily foreshadowing the real-life slaying of mob boss Carmine Galante seven years later… also at an Italian restaurant. 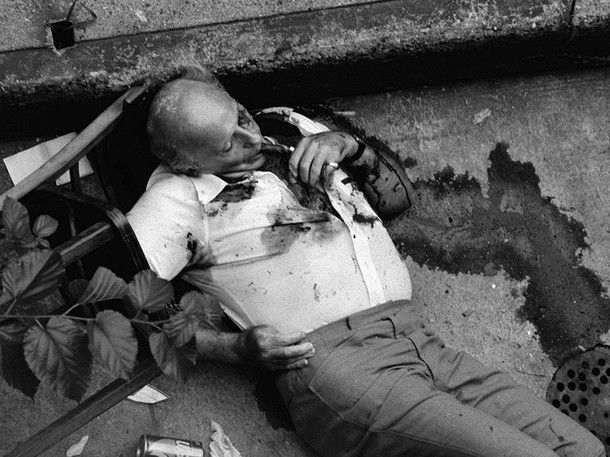 Sollozzo still sitting at the table recalls Dutch Schultz, while McCluskey – collapsed at the foot of it – would strangely be reflected by the killing of Carmine Galante in 1979. 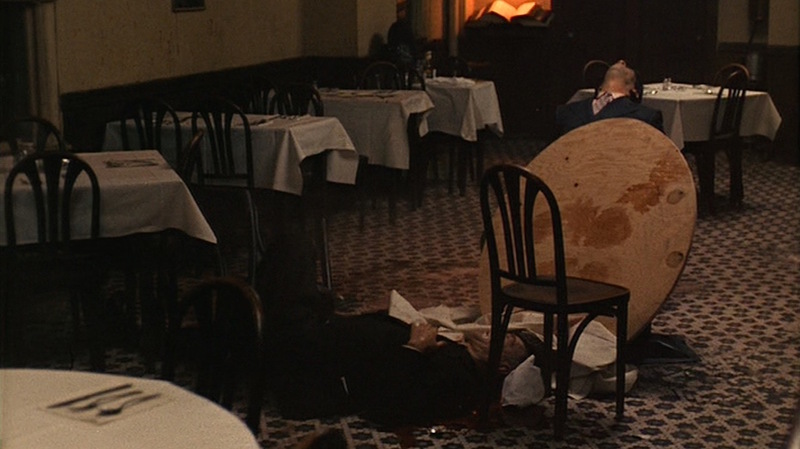 The restaurant in the film is the fictional “Louis’ Italian-American Restaurant”, which Sollozzo likes for its veal but Tessio likes for its old-fashioned toilet’s ability to hide a gun. Sollozzo might have a better point from a Yelp reviewer’s perspective, but at least Tessio is thinking like a gangster? 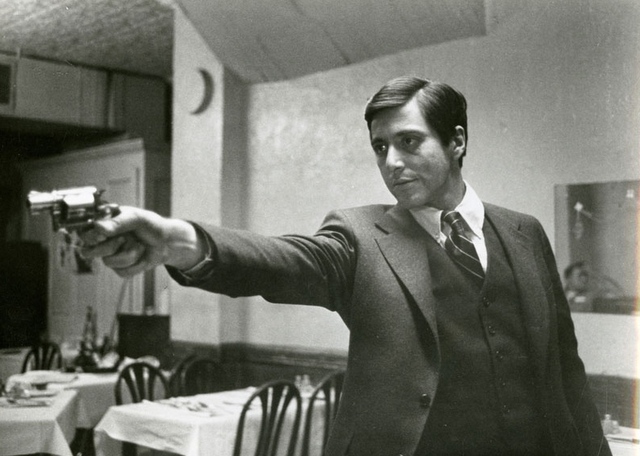 Originally, Coppola wanted to film at Mario’s Restaurant on Arthur Avenue which had been mentioned in Mario Puzo’s 1969 novel. Mario Migliucci refused, not wanting to stigmatize the now nearly 100-year-old restaurant as the site of a fictional mob hit and instead focusing on the food. 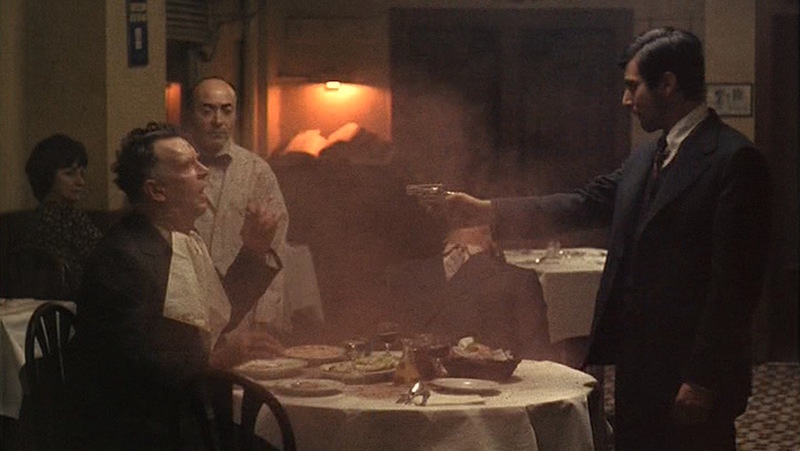 Thus, Coppola moved the scene at “Louis’ Italian-American Restaurant” to the Old Luna Restaurant in The Bronx, which closed down shortly after The Godfather was released. Michael is picked up in front of Jack Dempsey’s Broadway Restaurant on Broadway between 49th and 50th in Manhattan. Considering that Jack Dempsey’s also closed down shortly after the movie’s release, perhaps it was a wise move on Mr. Migliucci’s part to distance himself from the scene… albeit such an iconic one. 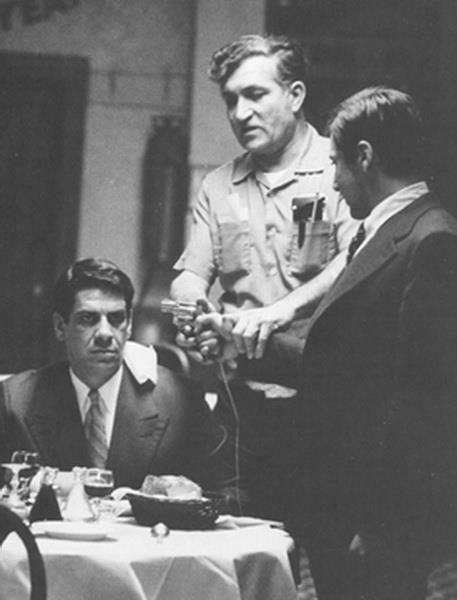 Joe Lombardi works with Al Lettieri (Sollozzo) and Al Pacino to guarantee that the scene – and the gun – goes off without a hitch. There was a metal plate on [Sterling Hayden’s] forehead and the squib on top of that — and [we] covered the whole forehead with foam latex skin, but left an area around the squib unglued so that I could take a hypodermic needle, prick it sideways through the skin, and squirt in a certain amount of blood to fill that shallow cavity — not so much that it would bulge. Then when the squib blew, it would blow a hole in the skin so the blood would pour out. The great trouble with that is it takes a lot of time to put it on, and when you finish, you have to take it all off, clean him up, and prepare him for another shot. It’s very time-consuming and of course you could not only have something go wrong in the filming of the scene, you could have a squib be a dud or something. Michael’s vengeful initiation into his family’s dark side is nicely introduced by the somber and moody “This Loneliness” piano solo performed by Coppola’s own father Carmine. The hauntingly beautiful piece wasn’t included on the official soundtrack release, but a version did appear as the fifth track on the rare The Godfather’s Family Wedding Album, also released in 1972. For his last moments as a civilian, Michael’s take on the Ivy League look signifies his acceptance of darkness overwhelming his previously law-abiding life. It’s as cold as they come, impossible to trace. 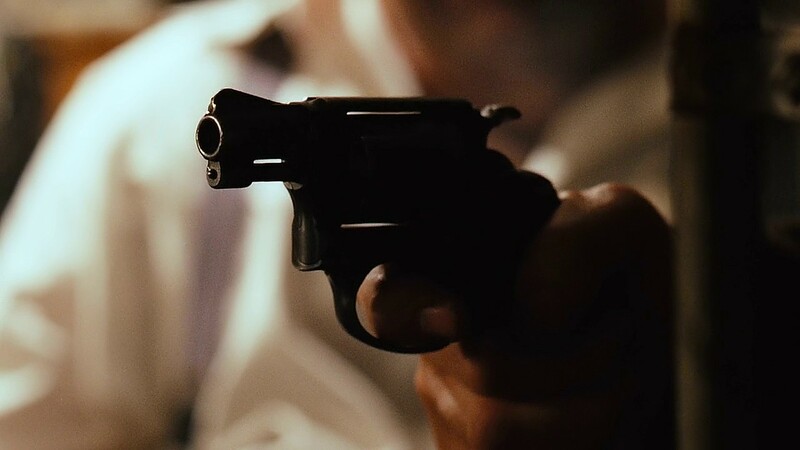 Clemenza knows that absolutely nothing is allowed to go wrong as soon as Michael draws a gun on a vicious mobster and a New York City police captain, so plenty of consideration is put into the firearm that Michael will use for the shooting. The gun in question is a Smith & Wesson Model 36 “Chiefs Special” revolver with a 2″ “snubnose” barrel. Clemenza hands Michael his killing tool. 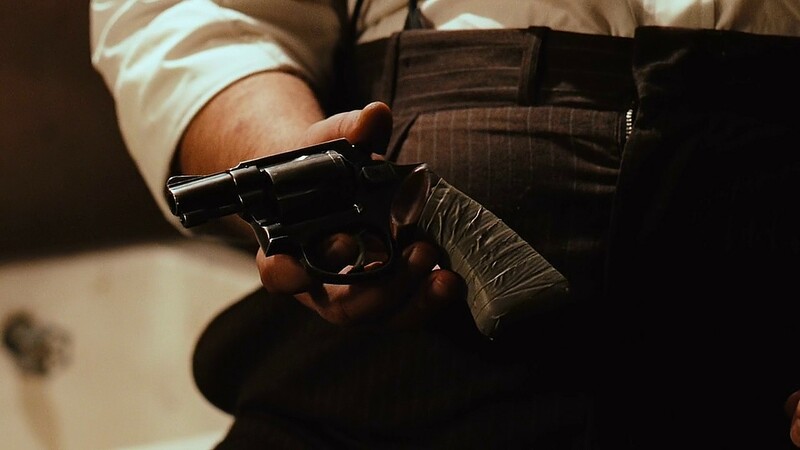 While the Chiefs Special looks like any standard snubnose revolver favored by gangsters of the era, it is actually slightly anachronistic for Michael’s 1946 shooting of Sollozzo and McCluskey as it hadn’t been developed until four years later. Smith & Wesson was hoping to fill the gap between the large-framed six-shot .38 Special revolvers like the Model 10 and the smaller-framed and less powerful weapons like the I-framed .32 Hand Ejector revolvers. In 1950, Smith & Wesson rolled out this J-frame five-shot revolver – named the Model 36 when S&W introduced its numbering system a few years later – to offer the powerful .38 Special in a smaller, more concealable package. Michael lets ‘er rip in the basement. What I want… what’s most important to me is that I have a guarantee: no more attempts on my father’s life. Interestingly, Pacino shares his birthday with co-star and cinematic sister Talia Shire, born six years later and thus celebrating her 70th birthday this year. As Michael makes his escape from Louie’s Restaurant and leaps onto the running board of his getaway car… or so he tried. 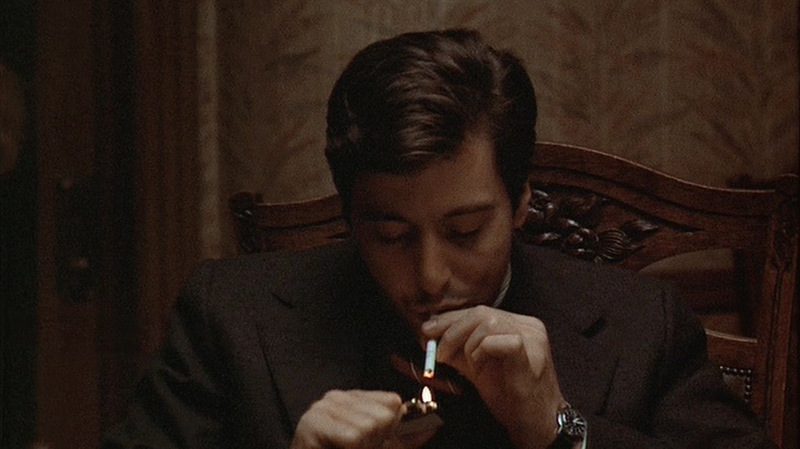 Supposedly, Pacino misjudged the leap timing and twisted his ankle, requiring the use of a cane for the next two weeks. Michael was not wearing a wide brimmed fedora in front of Dempseys. It looked like a Stetson I sold when I was with Worth & Worth in the 80’s. It was called the “Madison.” No pinch to the crown and 2 1/2″ brim with a welt edge and wide ribbed band. Very classic style. Worn by men in NYC, post-war. Thanks, Harris! I appreciate your expertise on this, and I’ll incorporate it into the post with your permission.